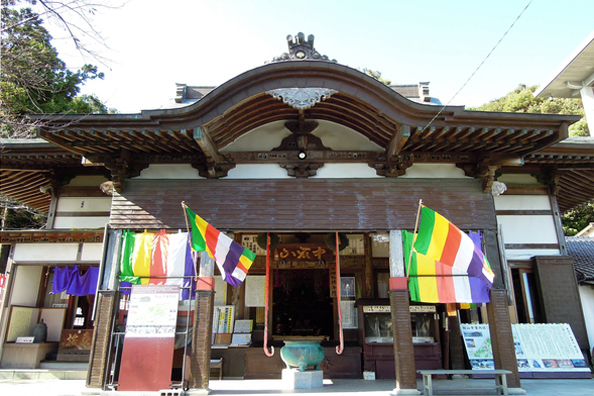 The zen temple Kanzanji of the Soto sect is located on the slopes of Mt. Tateyama, a small mountain about 50m high, located in the northern part of the Kanzanji hot springs town to which it lends its name. This historic old temple is said to have been established by Kukai (Kobo Daishi) in 810, it is a branch temple of Shuuyouji Temple on Mt.Akihasan (Detail for) in Haruno. Around Kanzanji, there is a footpath prepared where you can walk around enjoying the view of Hamana Lake for about an hour. While walking along the footpath, you can visit Enmusubi Jizouson, Atago Shrine, Ana Daishi and the Kanzanji Seishi Kannon Bosatsu. Left: Enmusubi Jizouson, where many come to offers charms in order to fall in love. There are also a variety of dynamic views created by the natural red quartz rock formations that were formed about 100 million years ago, with Tosaka Rock foremost among them. A "Fire Festival" is held at Kanzanji Temple every year on December 15. The priests and monks conduct a prayer service for fire prevention, good health and good harvests. The roaring flames are magical, and when the fire has died down, a barefoot fire-walking ceremony is conducted. At the end, the general public can also experience fire-walking, and those who cross the fire are said to be protected from illnesses. © Lake Hamana Kanzanji Onsen Tourism Association All Rights Reserved.